From earliest times the life of the Slavs has been connected with water. Like most ancient peoples, the Slavs built settlements near rivers and lakes. Fishing provided an important food source and waterways became main transportation arteries. Even in a rough-hewn boat it was easier and safer to travel long distances than it was to cut through a dense forest. Boat building techniques gradually improved. The canoe-like vessels of the Slavs, which were originally pushed through the water with punt poles, became considerably faster with the introduction of oars and sails. By the seventh century boat construction had sufficiently advanced to allow the Slavs not only to navigate rivers but also to venture into the open seas. They sailed to Thessalonica, Crete, the southern coast of Italy, and, at the very walls of Constantinople, engaged the Byzantines in naval battles. For long voyages these early Russians built a light, open vessel called a lodya. The Byzantines called it in Greek monoxile because it was made from a single tree, usually the hollowed-out trunk of an oak or linden. Layers of planking were secured to the hull to increase its height and oars were affixed to the planking. A single mast with a square sail made the lodya seaworthy, and it was light enough, when the need arose, for portage. Although it seldom exceeded twenty meters in length, a lodya often held a crew of forty. In the ninth century Kievan Grand Prince Oleg, with a fleet of lodyas, launched an attack against Constantinople, called Tsargrad by the Slavs. His victorious campaign proved the might and independence of Kievan Rus. According to the Chronicles, Prince Oleg "hung his shield upon the Gate of Tsargrad" and sailed back to Kiev with the treasures of his conquest. Igor Rurikovich retreated back to Kiev; however, in 943, having assembled an even more powerful force, he launched a successful assault against Constantinople and claimed for Kievan Rus the right to trade with the Byzantine Empire. Many of Russia's earliest heroes-some true historical figures, others purely legendary, or often a combination of the two-emerged from Kievan Rus. Along with his faithful warriors, Kievan Grand Prince Svyatoslav Igorevich became fabled for his acts of valor. Prince Svyatoslav's most celebrated deed was his conquest of Khazaria in 966 following a great sea battle. Sixteen years later Grand Price Vladimir, son of Svyatoslav, attacked Byzantium and engaged the Byzantines in yet another naval battle. The peace that resulted from friendlier relations with Byzantium permitted Kievan Rus to begin to develop craftsmanship, to engage in trade, and to learn how to construct in stone. Nevertheless, advancements in the art of shipbuilding proceeded very slowly. The early Russians continued to ply the lakes and seas in their dug-out boats and to transport their simple goods by river on crude, raft-like vessels. In 1043 Kievan Rus began its ninth naval campaign against Constantinople. Prince Vladimir, son of Yaroslav the Wise, sailed into the Bosporus with his flotilla of lodyas and utterly routed the Byzantine naval force. This marked the last assault of a Kievan Rus fleet upon Tsargrad. After the death of Vladimir Monomakh in 1125, the struggle for power between the princes of Ancient Rus intensified. Disunited and weakened through internal strife, the princes could give little thought to warring against neighboring states. The princes of Rus began to use their fleets of lodyas to fight against one another. In 1151 Prince Izyaslav Mstislavich used a more advanced type of sailing vessel in a battle against the forces of Prince Yury Dolgoruky: Prince Isyaslav's lodyas had decks and were constructed with rudders in both bow and stern. In the years that followed few other changes were made in the design of this yet primitive sailing craft. By the end of the twelfth century Vladimir-Suzdal had become a significantly strong princedom. Prince Vsevolod (son of Yury Dolgoruky and nicknamed Bolshoye Gnezdo, meaning "Great Nest") claimed for himself the title of Grand Prince of Kiev and proclaimed himself Grand Prince of Vladimir as well. Both Vsevolod and his son, Prince Yury II, equipped flotillas of lodyas and sent them against the Volga Bulgars. During one of his military campaigns Yury II founded the eastern-most of the Russian princedoms, Nizhny-Novgorod, at the place were the Volga flows into the Oka River. Yury II's efforts to strengthen the eastern boundaries of fledgling Russia were doubtless inspired by a presentiment of things to come. For it was in the East that the might of the Golden Horde was gathering; it was from the East that the Tatar-Mongols would descend and impose upon Russia the "yoke" that was to last for nearly three centuries. Among the Slavic peoples it was foreordained that the people of Novgorod should become the innovators of sailing and shipbuilding. Owing to the diplomacy and judicious policies of its princes, Novgorod was never plundered by the Horde. With each successive year, craftsmanship developed; the merchants of Novgorod flourished as trade increased. In contrast to the people of southern Russia the Novgoroders designed larger boats for transporting cargoes on the Baltic Sea and for waging maritime battles. In fact, the citizens of the Free City of Novgorod became known for their maritime exploits. Novgorod's bigger lodyas were built with decks and posed a far greater menace to its neighbors. In order to protect and strengthen commerce, Novgorod waged land and sea battles against the Swedes and, during the same period, repulsed frequent attacks by bellicose German knights. Novgorod used its fleet to attack the Swedes at Sigtun. Novgorod pillaged that Swedish town and carried off the booty won in the battle. The most prized treasure was Sigtun's massive red copper gate, called the "Sigtunskiye Vrata," which to the present day adorns Novgorod's St. Sophia Cathedral. In the early fourteenth century the princes of Novgorod again waged war against the Swedes-this time for the right to sail freely on the Baltic Sea. To hold back the Swedish army, Novgorod built fortresses in the area near present-day Finland: at the mouth of the Vuoksa River, the fortress Karela (1310); at the source of the River Neva, the fortress Oreshek (1323); at the confluence of the Rivers Okhta and Neva, the fortress Kanzi (1349). Lodyas from Novgorod sailed into the Arctic Ocean (called in olden days the "Breathing Sea") and, by the end of the twelfth century, Novgorod governed the Northern colonies of Perm, Pechora and the Yurga region in the northern Urals. Explorers from Novgorod entered the White Sea, which they called the "Cold Sea," through the Severnaya Dvina estuary and founded the first Russian settlements along its coast. The hardy pioneers who settled in this region came to be known as the Pomors, meaning "[dwellers] by the sea." The princedom of Moscovy had, meanwhile, been gaining in strength and growing in territory. The first true Russian State was established when Moscovite Princes successfully annexed surrounding territories in the fifteenth and sixteenth centuries. Yet, with all its territory, Moscow had no maritime port. After seizing the Crimean Khanate, the Ottoman Turks became the predominant power in the Black Sea. Moreover, Moscow's annexation of Novgorod in 1478 ended the trade monopoly of the Novgorod merchants and generally weakened Russia's position in the Baltic Sea. With no port and no fleet of vessels, Moscow was unable to challenge the strong grip that Western merchants from England, Holland and Germany held over Russian trade. Grand Prince and first Russian Tsar Ivan IV (Ivan the Terrible) sent an army to seize the southern Volga regions of Kazan (1552) and Astrakhan (1556), thus providing Russia with an entrance to the Caspian Sea. Russia captured the town of Narva (in modern Estonia) near the Baltic Sea and, for approximately twenty years, the so-called Narva Sea Route served to transport goods between Moscow and the Baltic. The greatest obstacle to trade in the Baltic Sea was the unabated piracy which severely restricted Baltic commerce. In response to the constant plundering of ships along the Narva sea route by Polish buccaneers and pirates from Danzig, Ivan IV enlisted the services of a Danish seafarer, Captain Carsten Rhode. Ivan IV financed the arming and outfitting of a ship and issued the Dane Letters Patent granting him the broadest possible powers-in essence, the right to pirate and plunder any and all ships not sailing under the Tsar's flag. Captain Rhode served with remarkable ardor. In time, the King of Denmark wearied of the incessant protestations issuing from the royal courts of Europe, felt compelled to intervene, and recalled the zealous Dane. In 1581 Swedish forces recaptured Narva, and trade along the Narva sea route ceased. In 1555 Ivan IV granted trade privileges to British merchants. They founded the Moscow Company and began sending ships annually into the estuary of the Severnaya [Northern] Dvina. Dutch merchants also began bringing their ships into the White Sea and Severnaya Dvina, and, in 1584, the town of Arkhangelsk was founded. Also toward the end of the sixteenth century a Cossack named Yermak Timofeyevich explored the lands of West Siberia and claimed them for Russia. The most rewarding discovery made by the European fur traders toward the end of the sixteenth century was an area of northwestern Siberia, east of the Yamal Peninsula, called Mangazeya. The Pomors had reached Mangazeya and trapped furs there in the early 1500's. They rounded the Yamal Peninsula by sailing on the iceutilizing a craft called a koch that they themselves had devised. (In fact, the Pomors originated a surprising number of navigational methods and devices that astounded European seafarers well into the nineteenth century.) By the seventeenth century the Pomors had built permanent settlements in and around Mangazeya. In the early years of the seventeenth century Russia experienced a period which historians call the "Time of Troubles," an interregnum marking the end of the Rurik Dynasty and the ascension of the House of Romanov. Russia's enemies took advantage of the internal strife which weakened the country, and Russia was obliged to honor the harsh demands imposed by Sweden in the Treaty of Stolbov. The Treaty dictated that Russia pay reparations to Sweden in the amount of twenty thousand rubles; surrender the forts of Ivangorod, Kanzi and Oreshek; and honor Sweden's monopolistic rights to trade in the Baltic Sea. The Baltic Sea became virtually Swedish territory. 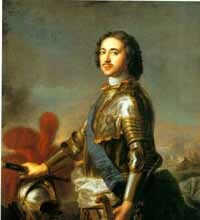 In 1682, at the age of ten, Peter Alekseevich became Tsar Peter I. Throughout his childhood, Peter I was fascinated by ships, shipbuilding and navigation. At Lake Pleshcheyevo, one hundred fifty kilometers northeast of Moscow, a recreational area was set aside for the young Tsar and his childhood friends. A miniature shipyard was created and in it were built replicas of Western sailing vessels. This preserve, named the "amusement flotilla," played an important part in Peter's naval education; he and his young friends spent all their waking hours sailing about the lake in their small ships, engaging one another in mock battles. 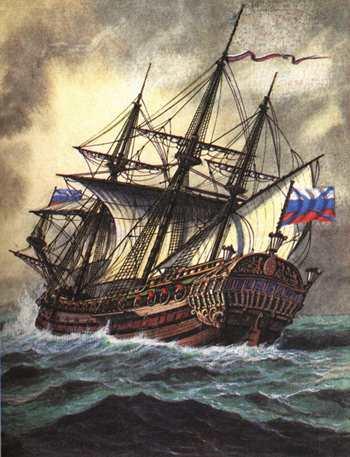 Peter arrived at Arkhangelsk on the White Sea in 1693, ordered the creation of a state shipyard in Arkhangelsk, and sailed for the first time in a genuine ship on a real sea. A year later the ships Svyatoye Prorochestvo [Holy Prophesy], Apostol Pavel [Apostle Paul] and the yacht Svyatoy Pyotr [Saint Peter] were sailing in the White Sea. Tsar Peter understood, however, that Arkhangelsk was extremely limited as a port. Because of its severe arctic climate and remoteness from the center of Russia, Arkhangelsk could never be the country's main port. Tsar Peter insisted that Russia must have direct access to the Baltic and Black Seas. Five years before Peter I became Tsar, Russia had formed an alliance with the German Empire, Rzech Pospolita (the Kingdom of Greater Poland), and the City-State of Venice in order to oppose the Ottoman Turks. In 1695, during his first campaign against the Turks, Peter I quickly realized that Russia's free access into the Black Sea and Sea of Azov was not possible so long as the Turks held the Fortress of Azov. In a protracted and ultimately disastrous attempt to capture Azov, the Russian forces were defeated: Azov was both well fortified and protected by the Turkish fleet. It now further became apparent that wresting Azov from the Turks depended upon the creation of a Russian naval fleet. 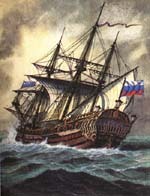 Consequently, at the Preobrazhenskoye and Voronezh shipyards, construction of a fleet of ships was undertaken in earnest in 1696. The shipbuilding proceeded quickly, and by the spring of that same year two warships, 24 galleys, four fire ships and over 1,400 smaller boats had been constructed and were ready for launching. Peter I named his trusted confidante and chief advisor Franz Lefort commander and admiral of the Russian fleet. Under Lefort's command the Russian naval attack force proceeded down the Don River toward Azov. The pride of the flotilla, and its most threatening vessel, was the Apostol Pyotr [Apostle Peter], a 34-gun combat frigate. Although shallow waters prevented piloting the Apostol Pyotr directly into the Sea of Azov, the frigate took part in the bombardment and blockade of the fortress. On 20 May forty boats and galleys, commanded by Cossack Hetman [Chieftain] Frol Minyaev, sailed into the Sea of Azov in support of the Russian fleet. The Cossacks captured twelve Turkish vessels, laden with ammunition and provisions that were destined for the fortress. By 3 June Azov was totally surrounded by Russian sea and land forces. Ten days later another Turkish fleet arrived to aid the beleaguered fortress; however, the Russian display of force appeared so formidable that the Turkish ships never joined the battle. On 18 July Azov surrendered. Although jubilant over Russia's victory at Azov, Peter I grew even more determined to create a true Russian navy. While in counsel with the Boyar Duma on 20 October 1696, the Tsar proposed the creation and perpetual maintenance of a Russian fleet. The Boyars agreed, declaring "The seagoing ships shall be! ", whereupon the Azov Naval Base was founded. Its creation in 1696 marks the birth of the regular Russian navy and naval fleet. From a specially erected structure called the Tsar's Tent on the Voronezh River, Peter himself was in command, but construction of the ships was directed by Chief of the Admiralty Alexander Protasyev. The manual work at the Voronezh shipyard was performed by thousands of serfs, overseen by hundreds of shipwrights and officers brought from Western Europe. In 1697 Peter I sent sixty young noblemen to Europe to learn shipbuilding and study navigation. Peter himself soon followed. In Holland he studied the most advanced nautical sciences of the day, worked in ship construction as a ship's carpenter and earned the title of shipwright. He brought back to Russia books and charts, models of ships, tools and, of even greater significance, vast knowledge and new skills. Peter I founded two important schools for maritime studies. In 1698 the Nautical School (for young future seamen) opened under the direction of a Serb named Melankovich, a veteran of the Adriatic. In addition, Russia's first secular institute of higher learning, the Nautical School of Mathematics and the Sciences, opened in Moscow in 1701 in the Sukharev Tower. By the beginning of the eighteenth century, a total of 134 ships had been constructed; however, the level of craftsmanship was judged to be, at best, mediocre. The ships had been built by private entrepreneurs who had sub-contracted to the State; many vessels had been constructed with undue haste at the expense of their seaworthiness. The ship's carpenters were often under qualified, and a matter of further concern was common thievery: not infrequently tools, rigging and lumber were mysteriously spirited away. Consequently, on 20 April 1700, responsibility for ship construction was transferred from private concerns to the government. Fyodor Apraksin became the new Chief of the Admiralty and was given authority to maintain the very strictest control. In that same year the pride of the Russian navy was launched. Christened the Predestination, it was a 58-gun warship built according to Peter I's own design and under the direct supervision of the Tsar and his master shipwright Fedosey Sklyaev. In 1699 Russia's Azov fleet set sail for Kerch, the peninsula in the eastern Crimea. The attack fleet numbered ten ships of the line armed with a total of 366 guns and carrying a combined crew of 2,126 seamen and officers, and accompanied by two galleys and sixteen smaller craft. The Pasha of Kerch was so overwhelmed at the sight of this unexpected and threatening display of naval strength that he surrendered without offering resistance. The 46-gun Krepost [Fortress] carried the Tsar's first diplomatic mission across the Black Sea to Constantinople. According to the truce signed a year later, the Sea of Azov and its coastal territory were officially relinquished to Russia. Nevertheless, following Russia's loss to the Turks in the army campaign of 1711, the Treaty of Prut returned the Azov lands to the Turks.